After graduating from the University of Wisconsin, Co-Founder and CEO Matt Brueggeman moved to Beijing, China. While living there, he saw scores of small electric vehicles on the road and how they dramatically affected the way people moved and interacted with the world. In addition to the cost savings, ease of operation and the obvious environmental benefits, Brueggeman, along with fellow co-founder Alex Meyer, believed that introducing small electric vehicles in the United States could represent something greater. As small electric vehicles are built exclusively for short distance transportation, upon riding a small electric vehicle cultural focus naturally shifts from the individual to being a member of the local community. With that as the source of our drive, Flux Mopeds was born. Flux believes in a balanced and pragmatic application of technology. As our flagship vehicle, the Flux EM1 is built to be the optimal balance of range, charge time and speed for short distance transportation. Getting to today has been a marathon. We have built three generations of the Flux EM1 and are now producing the fourth generation model. The Flux EM1 is the vehicle it is because of our countless hours of development forged in our attitude that the Flux EM1 should be both maintenance free and affordable. 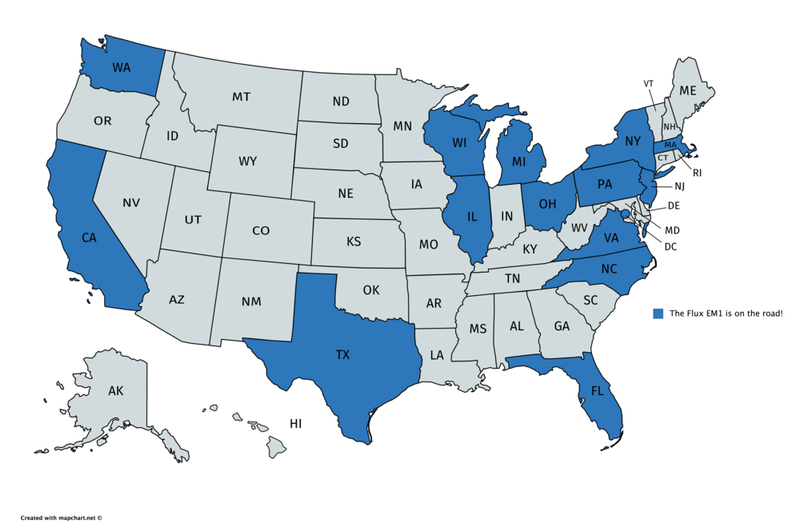 The Flux EM1 is on the road in 15 states!